I saw these boots via a link shared on Twitter. They are quite possibly the most fabulous boots I’ve ever seen. I do love a pair of brogues, and these are utterly brilliant. By an odd twist of fate, I realised the other day that I was in need of a new pair of shoes. My current shoes are a rather nondescript, functional pair of smart(ish) black work shoes and are, to put it mildly, starting to show their age. I really fancy something a little more… interesting. 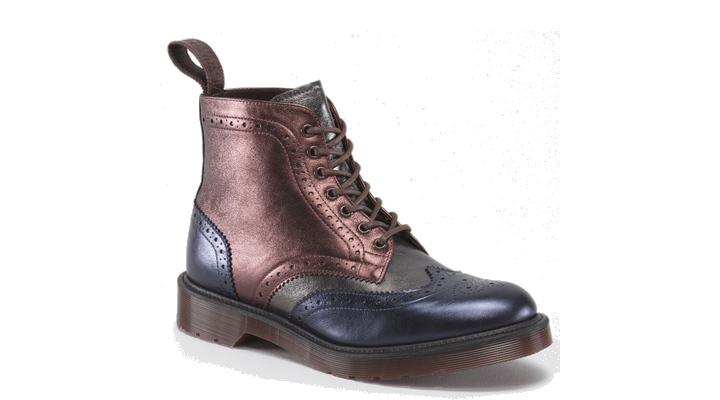 I’m saddened by the fact that I’m fairly certain I’ll never be able to afford to drop £340 on a pair of DMs, gorgeous as they are. I really quite fancy a pair of DMs in oxblood red, as a compromise! Abi (@sewyou) from Sew You Handmade set up a Pinterest board for lovely man shoes. It’s full of lovely footwear. Go check it out! Is there a girl version? They are GORGEOUS! Ooh lovely! I am partially boycotting them though as my husband used to work for DM who failed to pay him his final paycheck when they made him redundant. He’s had to take them to court. He won his case but they still haven’t paid. Bunch of thieves!